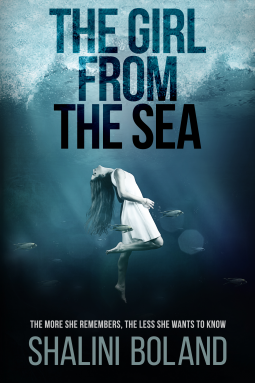 In the praise surrounding Shalini Boland's latest novel, The Girl From the Sea, readers are promised a 'gripping pyschological thriller', a 'chilling suspense story'. On the other hand, what readers receive is a simple mystery that explores the life of a young, rich woman who suffers from amnesia. When I decided to read this story I was intrigued by the plot and hoping for something similar to Jenny Milchman's Cover of Snow, which was an edgy mystery with many layers. As the mystery thickened the characters continued to develop and the connections between characters became evident throughout the story telling. The Girl From the Sea has so much potential but the mystery does not deepen throughout the story and it is very one-dimensional. It's these kinds of stories that don't have to be rushed, they deserve an intricate plot with loops and twists. Surprise and subterfuge are traits of a mystery that is not found here. It was almost as if nothing concrete actually happens in the story right up until the ending, or turning point, but the turning point comes way too late. Even though there isn't anything in the story that directly points fingers at anyone for possibly trying to harm Mia, it becomes obvious quickly. She doesn't go looking for clues like a detective, but throughout the story she comes across information that tells readers about the people she came into contact with on a regular basis and about what kind of person she might be. Learning about the people she knew before losing her memory leads to a predictable conclusion. The Girl From the Sea was an easy read, which is not what I would say to describe a story that is supposed to be gripping. It's not scary, doesn't make you want to read it with the lights on, and it doesn't take you on a wild ride. I would like to read more from Shalini Boland because I feel she can give her stories more depth, but this one just doesn't take it to the right level.